As I write these words, I sit with a bowl of matcha, the Japanese powdered green tea used in traditional ceremonies, and enjoy the quiet morning hours. Tea is a form of meditation for me, a way of being present and practicing paying attention. It is a way of slowness, of savoring life. And it is a way of focus for me. I find that if I’m having trouble concentrating on one thing, pausing to brew some tea is a great way to regain that focus. I’ve gotten some of my best writing done with the aid of a cup or bowl of tea. I’m no tea expert, so this guide won’t be a guide to how to brew the perfect tea or how to choose great teas. In comparison to actual tea experts, I will have many novice errors. I am fine with that, as my purpose here is simply to share some rituals I use for focus, for slowness, and for health. All three of these rituals help with focus, slowness and health. I’m giving them separate names only to help show how I use them, but really they can be used interchangeably. When I need to get my most important work done, I will often take a few minutes to brew some tea. This is a small ritual that signals that it is time to stop with all the distractions (and yes, I have many of those), and clear away everything but what I want to focus on. I clear away everything on my computer and desk but what I need to write, and my bowl of tea. So the browser gets closed, all apps but my writing app, all other devices shut down. 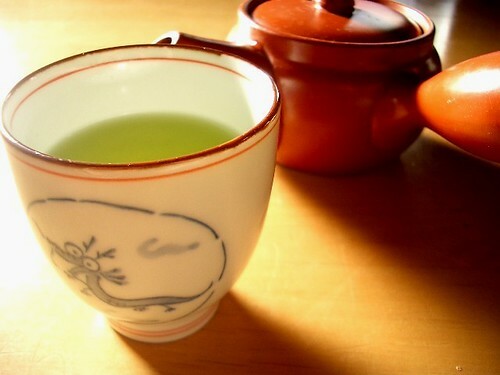 I take a sip of the green tea, and enjoy its thickness, its slight bitterness (people often offset this with delicious Japanese sweets or crackers), it sweetish aftertaste and fine grit left on my tongue. I sit, I breathe, I write. Then sip, and repeat. Modern life has a tendency of becoming rushed, of moving from one appointment to the next, one email to the next, until our days are a blur. I find tea to be perfect for helping me to slow down, to return to the natural rhythm of life. So in the afternoon, when things become rushed, I pause. I put some loose, whole-leaf tea (a sencha or an oolong) into a small teapot as the water heats up. I take a moment to enjoy the sight of the consistency of the leaves, hand-picked by farmers from small farms in Japan or Taiwan, and breathe on the leaves to evoke their fragrance. I pour just a teacupfull of water into the pot, and pay attention to my breath as the tea steeps for about 30 seconds (I like the tea lighter, not bitter). This breathwatching is a short meditation, like the rest of the ritual. I pour the slightly steeped tea into a small cup, about half the size of my fist. I savor the color, texture, smell, and try to see what aromas I can detect (I’m not very good at this). Then I sip. The first sip is a revelation, as the rushed world fades away and the delicate tea hits my tongue, washing it in its warmth and with flavors that began their journey in the earth, thousands of miles away in a country that has been doing this for a millenium or two. The tea is not overpowering, but subtle. It is mostly water, with only a slight essence of the leaves infused into the liquid, so timid that I have to really pay attention to notice it at all. The moment is entirely floating in this whisper of a broth, slowed by the hesitation of my attention as it stops its monkeying around and starts to enjoy the stillness.